Use the form below to inquire about Homestay at Guddadamane . Use the form below to reserve for Homestay at Guddadamane . These are in the house and open out to the common verandah which runs around the inner courtyard. An ideal weekend getaway, this Homestay at Guddadamane sits atop a hillock affording spectacular views of the landscape. Set amidst a sprawling 30-acre coffee plantation, this Homestay at Guddadamane provides you plenty of opportunities to gaze out at the tree tops enveloped in misty clouds as the day comes to an end. With paddy fields and a lush wooded area, communing with nature comes easy here. The highlight is definitely the expanse of active wetland that seeps water into a lake. The picturesque views from every spot on the property and the wind that keeps you company all day long makes you feel on top of the world! 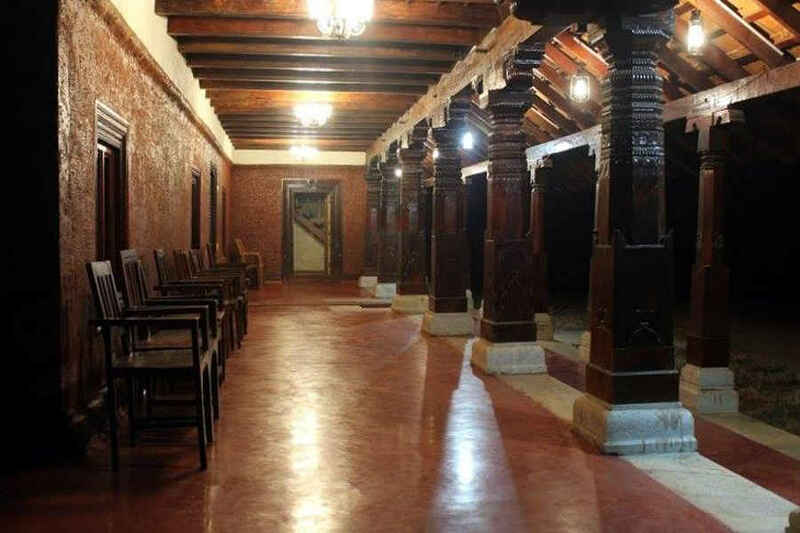 Constructed from painstakingly selected and chiseled laterite stone over four years, the main building of this Homestay at Guddadamane features a traditional courtyard that opens to the sky. The tiled roof, the curved arches, and the wooden pillars with elegant designs evoke memories of a bygone era. Feel free to walk into the open kitchen for all your food and drink requirements all through the day. A quick snack, meals, coffee, tea, or juice are all available on request whenever you want them. The cozy library has a good selection of books and board games while bonfires in the evening are a good time to relax and unwind before turning in for the night. The heritage house has three rooms which can accommodate two people each with provision to accommodate a third person if required. All rooms share a common verandah that opens out into the central courtyard. Every room also has an individual sit-out facing outwards to enable you to enjoy the stunning geography. This Homestay at Guddadamane also has two spacious private bamboo cottages in the woods that can each accommodate up to four people. Suitable for families, these cottages also come with their own sit-outs and outdoor spaces. Definitely, an ideal place to enjoy a walk in the clouds! The homestay is pet-friendly and welcomes pets at a flat charge of INR 250 per day. Pets are allowed provided that they stay off the furniture and linen and the owner ensures their safety and the safety of other guests at the homestay. Gazing out at the spectacular views that keep changing all through the day, depending on weather conditions, is enough to keep you occupied during your holiday at this homestay. Enjoying the books in the library and playing some of the board games available are other slow paced activities you might indulge in during your stay here. The wooded area offers plenty of walking trails if you crave some exercise or exploration. The coffee plantation and the paddy fields are sure to tempt you out of your cozy nook at the homestay. Just be sure to stay alert for elephant movements in the area. If you are willing to step out of the boundaries of the homestay, you could pay a quick visit to the Manjarabad Fort which is shaped like a star. Built by Tipu Sultan in the late 18th century, this fort is considered the only one if its kind in Karnataka. Situated about 3,200 ft above sea level, it is said to have a tunnel that connects to Sri Rangapatinam, the erstwhile capital of Tipu Sultan. Mangalore International Airport is the closest at 152 km while Kempegowda International Airport, Bangalore, is at a distance of 257 km. Sakleshpur is the closest railway station at 15 km while Hassan railway station is around 55 km away. Mangalore railway station is about 130 km away while Bangalore railway station is about 236 km away. Sakleshpur is about 15 km from the property while Hassan is around 55 km away. Mangalore city is around 145 km away while Bangalore is about 236 km away, both accessible via NH 75.